Adeleke’s seat was empty throughout the two-hour debate. Adeleke was one of the five candidates picked and invited for the debate which featured the All Progressive Congress candidate, Gboyega Oyetola; ADP candidate, Moshood Adeoti, ADC candidate, Fatai Akinbade and SDP candidate, Iyiola Omisore. 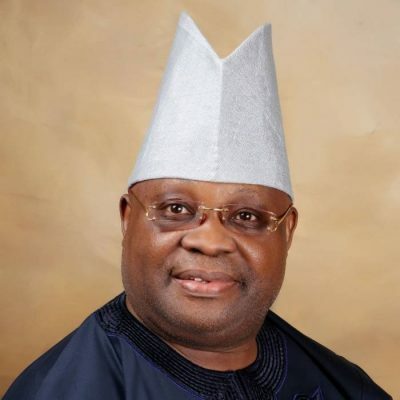 Speaking to newsmen on the phone on Sunday nght, the publicity director of the Adeleke campaign organisation, Olawale Rasheed, said while they were on their way to Osogbo, a community where they had gone to campaign blocked the highway. He said they (community) had been marginalised all these years and that there had not been developments in their area. “To our surprise, while we tried to skip the small towns and villages as we made efforts to meet up, they started trooping on the road; As I am talking to you now, we are just entering Osogbo,” Rasheed explained. “What we did was to send a message to a correspondent of Channels, and later I sent a message to Seun Okinbaloye (Channels presenter). We are just entering Osogbo now as I speak to you.